A. Reconfigure the Astoria-Ditmars Boulevard terminal tracks to increase AM peak Manhattan-bound train frequency and reliability. The Astoria-Ditmars terminal’s track configuration limits AM peak service into Manhattan, and creates service gaps that lead to station and onboard N/W line crowding. B. Reroute the N/R lines and de-interline (route-simplify) the Manhattan Broadway Line to increase train frequency and reliability, while reducing the Lex/59 St station crowding problem. Undertake an in- depth comprehensive route review: model the following conceptual reroutes and line simplifications. Alternative 1: Reroute the N line to follow the Q line to 96th Street. ▫ Double W service frequency to cover the loss of N service to Astoria during weekdays, and run W service to Astoria on the weekends. ▫ Extend a portion of W trips to a Brooklyn terminus to reduce terminal delays at Whitehall Street. ▫ Educate riders on service changes and alternatives. Alternative 2: Reroute the R line to join the W line through the Lexington Av/59 St station to Ditmars Blvd. in Astoria. Reroute the N line to join the F line through the Lexington Av/63 St station to Forest Hills. ▫ Increase frequency on the M line. ▫ Alternatives 1 & 2: De-interlines (simplifies) the Broadway line to improve reliability by reducing interlocking delays. ▫ Alternatives 1 & 2: Reduces Lex/59 St station crowding and reduces the platform shuffle by having only two lines (R/W) arriving at the platform instead of three (N/R/W). ▫ Alternative 1: Eliminates merges at 34th Street (Manhattan) to speed up trains, allowing for more train throughput. ▫ Alternative 2: Eliminates merges at 34th Street (Manhattan) and Queensboro Plaza (Queens) to speed up trains, allowing for more train throughput. ▫ Alternative 2: Reduces crowding on Queens Boulevard express E service since riders can stay on the N line for express service in Manhattan. ▫ Alternative 1: Adds service to the Second Avenue line, addressing ridership needs on the corridor, while making the new line a more attractive alternative. A. Ensure 4/5/6 line CBTC is installed within five years of Fast Forward implementation to improve reliability, resiliency, track speeds, and crowding. NYC Transit’s Fast Forward Plan has prioritized 4/5/6 CBTC installation from 149 St/Grand Concourse to Nevins St.
B. Continue track speed and signal timer adjustments to improve train speed and throughput. track area, thus eliminating the need for the gap fillers and subsequent delays. 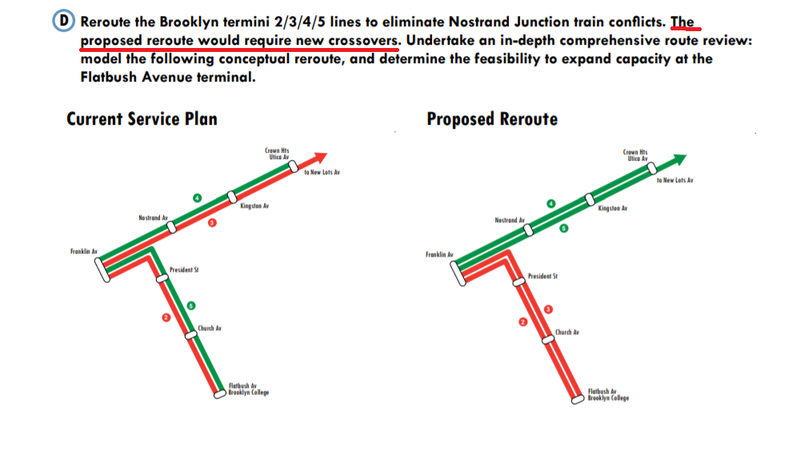 D. Reroute the Brooklyn termini 2/3/4/5 lines to eliminate Nostrand Junction train conflicts. The proposed reroute would require new crossovers. Undertake an in-depth comprehensive route review: model the following conceptual reroute, and determine the feasibility to expand capacity at the Flatbush Avenue terminal. A. Apply the methodology and resources that were applied to Grand Central station to Lex/59 St crowding and levels of service issues. In the future, look toward incorporating requirements for developers for value capture opportunities and other potential investments to apply such methodologies and resources. ▫ Improves mezzanine, platform, and staircase circulation. ▫ Provides more platform space by removing bulky stair casings and columns where feasible. ▫ Improves station access by reopening and providing new station entrances. ▫ Provides the opportunity to make the station ADA accessible. B. Establish a Lex/59 St station crowd control mitigation plan staffed with additional platform controllers. NYC Transit lacks a robust crowd mitigation effort to address extreme crowding conditions. During peak hours for the Lex/59 St station, platform crowding during the PM commute can become so extreme that it is difficult to exit and board trains, stairwells become backed up, severely limiting platform movement. C. Conduct regular table-top exercises to address Lex/59 St station crowding situations. ▫ Defines how to measure when the station becomes congested. control procedures are put into place. ▫ Station is equipped with a dedicated station control room to facilitate crowd control operations. D. Create station passenger-based crowding metrics, to better inform NYC Transit of when to implement station-specific crowd-control measures. NYC Transit does not have a crowding metric indicating which stations are under extreme stress from overcrowding. Riders waiting for the Queens-bound N/R/W service in the PM peak face large stairwell and platform crowds as 4/5/6 trains bring more riders to the station seeking to transfer to less frequent N/R/W service. ▫ Addressing station overcrowding through operational adjustments. ▫ The metric can inform and support capital investment needs for improved capacity and expansion efforts. ▫ Bus travel is prioritized in the corridor, which increases bus speeds and frequencies. ▫ Frees up subway capacity, with more Lexington line subway riders taking buses for short distance trips. I saw this yesterday. It was already on the site, having seen the PCAC's page on different revenue sources. I love the Astoria recommendation. Me too! A good friend of mine works there; this is truly amazing stuff they've put together (the dwell time data makes me angry -- no civilized place has >1 min dwells). Thanks for flagging this @Around the Horn! Good to know that they’re looking into fixing these issues. I also like how that report addresses the issue with Lexington Avenue 59th Street. I’ve been using that station on an occasional basis for 5-6 years now and the crowding there since the return of the is reaching close to unbearable. As to Solve the issue that it has, I feel like that it’s a tough problem to solve because you can’t simply take down pillars or expand the platforms. platform controllers sound nice but I don’t think that’ll do enough. One last thing I’ll point out (and this is mostly biased) Mezzanine reconstruction, and making Lexington/59 ADA is a whole lot easier than it sounds/looks. Reading this really made my day! I’m glad the PCAC sees what we’re seeing. Now we just need MTA management to get on board. Split out from the proposals thread to avoid getting buried in the other ideas. Channel 11’s Greg Mocker just did a story about this very issue, along with the upcoming closing of Astoria Blvd. After reviewing the Rogers junction trackmap, I'm not sure how de-interlining Rogers helps in any way, unless they add switches east of the junction but west of Nostrand Ave Station. I'd prefer if these audits and reviews actually led to some real changes. Every so often, we have line reviews done by either outside agencies or internally by the MTA and almost every time, they all lead to the same result: nothing changes. It's good to know what's preventing optimal efficiency in the subway. It doesn't help if all these reports just sit on a desk somewhere. If the goal is to tank service, then this is a great idea. If not, then I would suggest redesigning that particular stretch of the Eastern Parkway Line in order to address awful merges and horrendous relays for short-turned trains. My idea would be that these audits and reviews would help identify problem area's that could be fixed in an upcoming GO or as part of a larger capital project. For example, with this report in hand the next step would be implementing the suggested crowding procedures at Lex-59th and signal adjustments along Lex while looking into the larger capital recommendations, like the de interlining proposals and the Union Square proposal to determine the best course of action for those projects and then seeing them through completion. An ops planning employee once told me "I am paid to write reports that my boss will never read. What you are asking is a political question". I used to post my suggestions on the reports that I had to send to Albany and i asked the exact same question why it was not included in the report to the commissioner as every other department posted what they were doing. I never received an answer. The state Department of Audit and Control would be at Arthur Kill Correctional Facility many times over the years to do their sampling, issue a report that would be challenged (of course) and the department. The changes of course that they agreed to would be cosmetic and back to business within months. The only time that the Department and my area Library Services implemented major changes was when a new commissioner came in 2008 and changed time frame for sending in reports.At that time a new person was placed in charge of Library Services and it was the only time that I can remember that the supervisor asked the librarians what they wanted attend the changes were implemented soon after they were posted. It is very rare that there are supervisors who are political even though they are under civil service who will take a stand on an issue and I think that the reason is New York State Civil Service Law 75 (b) is beyond being useless.